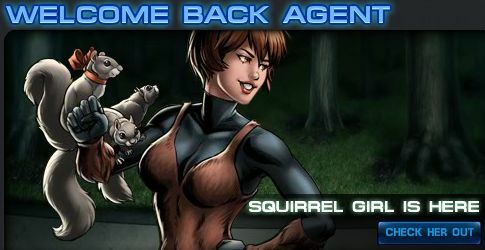 Agents can now take part in an exclusive covert task that upon completion will unlock the ability to purchase our newest heroine, Squirrel Girl! This covert task will only be available for a short time! PLEASE NOTE: Some players may not see the covert task right away. If this is the case, you will have the task tomorrow after the nightly reset. 1. Change of Subject - Defeat 5 Test Subjects in Season 2. Test Subjects have been experimented on without their consent, granting them super powers at the cost of their minds. They can be found in Missions 1, 2 and 4. 2. Another Earth - Survive an Incursion. Incursions are battles against Heroes from alternate realities. They are found in Season 2. 3. Splice of Life - Defeat Sugar Man. Sugar Man is the Boss of Season 2 Mission 1: Artificial Sweetener. 4. Oakey Dokey - Collect 15 Acorns. Acorns are dropped in combat by enemies in Season 2. They can also be purchased in the store. (Tip: They tend to drop on Mission Bosses and once an Acorn drops, your best bet is to lose and repeat the fight and lose again until 15 are collected; Selene in Mission 5 is especially good for this). 5. Prove Yourself - Win 3 PVP Battles. Squirrel Girl wants to see how well you fight. Compete in PVP to test your skills against other players. 7. Dragon's Lair - Defeat Dragoness in Season 2. Dragoness is the Boss of Mission 3: Sword in the Stone. 8. Chitter Chitter - Research the Squirrely-Talkie in the Lab. Research the Squirrely-Talkie to complete this task (cost 100 Silver and takes 8 hours to finish) . 9. Deep South - Complete the Rogue and Gambit Heroic Battle in Season 2: Mission 1. Heroic Battles are classic matchups between Heroes and Villains. To participate, you must have that hero recruited. 10. The Fix Is In - Defeat Fixer in Season 2. Fixer is the Boss of Mission 6: To Catch a Thief.